Bharat Sanchar Nigam Ltd.(BSNL), state owned and the biggest telecom service provider of India, is the 7th largest telecommunications company in the world with more than 2.5 million internet/broadband customers in the country. 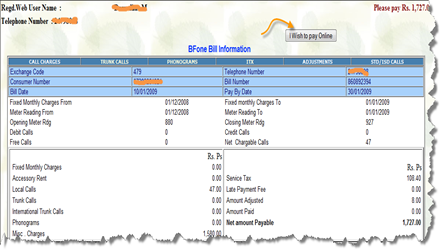 BSNL recently introduced online bill payment service for paying your mobile, landline, WLL and broadband monthly bills. To pay the BSNL bills online all you need to do is to “locate the BSNL website of your region” and signup for a free account. But locating the BSNL website corresponding to your region is the little toughest job. We have identified most of the BSNL regional websites for online bill payment and listed below. If your location is missing in the list, please go through the page BSNL Circle Sites . BSNL Portal Andra Pradesh: Adilabad, Anantapur, Cuddapah, Chittoor, Guntur, Hyderabad, Karimnagar, Khammam, Kurnool, Mahabubnagar, Nalgonda, Nellore, Nizamabad, Ongole, Rajahmundry, Sangareddy, Srikakulam, Vijayawada, Visakapatnam, Vizayanagaram, Eluru & Warangal. Chhattisgarh: Ambikapur, Bilaspur, Durg, Jagdalpur, Raigarh & Raipur. Karnataka: Bellary, Chikmagalur, Chitradurga, Mangalore, Shimoga, Belgaum, Bijapur, Dharwad, Karwar, Hassan, Kolar, Kodagu, Mandya, Mysore, Tumkur, Bidar, Gulbarga & Raichur. Maharastra: Akola, Amaravati, Beed, Bhandara, Chandrapur, Dhulia, Gadchiroli, Latur, Nanded, Nasik, Nagpur, Parbhani, Raigad, Ratnagiri, Sindhudurg, Satara, Whardha & Yeotmal. Punjab: Amritsar, Chandigarh, Bhatinda, Ferozpur, Hoshiapur, Jalandhar, Ludhiyana, Patiyala, Pathankot, Ropar & Sanjrur. Tamilnadu: Coimbatore, Cuddalore, Dharmapuri, Erode, Karaikudi, Kumbakonam, Madurai, Nagercoil, Nilgiris, Pondicherry, Salem, Thanjavur, Trichy, Tuticorin, Tirunelveli, Virudhunagar & Vellore. BSNL Circle Sites This provides the exhaustive list of all BSNL official websites. If your region is not listed above then check this website. /strong>. We hope the process will be more or less same with other BSNL websites. Step 1. 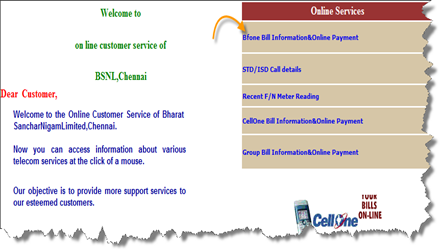 Click here to launch the Chennai telephones BSNL Portal/Website. Step 1. 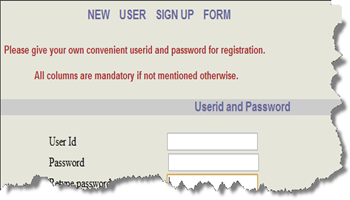 After successfully activating the account, enter your username and password to access the site services. Step 2. Click on the BFone Bill Information &Online Payment link available in the welcome page to see your monthly bill details. Step 4. Choose your payment option and click submit to continue the online payment. You can pay either using a credit card or using internet banking service of your bank. So, these were some of the BSNL websites for online bill payment, I hope you enjoyed this article. Do share your feedbacks through comment box. Also you can subscribe to Techdreams newsletter to receive daily articles into your mailbox for free. 3. Any time (24*7 hr) bsnl cell are shown ” network busy” while make a call to other person . 4.when i try to make a call a person sitting in front of me then also i’m unable to make call. To such person. 5. Sms are delivered after 10-12hr from sending time. 6. Meaningless & useless service sms are send by service provider too much. hi, Kindly forward the pending final bill duplicate copy to my e-mail ID. please send me a bill copy for mobile no. 7xxxxxxx for month jan.
i am not able to get my proper phone bill i have not received the correct bill yet. My broadband connection is unlimited but the bill is showing 250 scheme plan .What should i do? Please help to add me as an user to BSNL account. I FORGOT MY USER ID AND PASSWORD SO I AM UNABLE CHECK MY BROADBAND DETAILS. SO KINDLY SEND ME THE VALID USER ID AND PASSWORD AS SOON AS POSSIBLE SIR. AND ALSO SEND ME THE PROCEDURE TO PAY TH BROAD BAND BILL IN ONLINE ITS SO KIND OF U SIR………. how may i get it? and can i get it for individual day detail? My BSNL land-line is not working properly. it is very noisy. I have written complaints with telephone exchange and also lodged complaints with 1500 but I am very much frustrated with BSNL reply. I’m a BSNL user from Maharashtra. I want to pay my landline and Broadband bills online. please help. How to down load duplicate land line detail bill from net .i amtrying but could not get it. Kindly help me. Hi, I am from Pondicherry, When I am registering my phone, they will ask unique ID, I didn’t get my unique id from bill, becoz this is New Connection, I am using my last 4 days?? Please Help me??? i m customer from jind telecom distt in haryana, i want to know that when will start online bill payment for land line bill in our distt. sir, how to pay BSNL bill through online in North-East region(Agartala). my phone,s out going hs bee barred as i couldnt pay the bill on time..i think every one in the world knows what is happening in kashmir?but as far as BSNL is concerned ,they seem to be openeing their offices in kashmir everyday.i want to pay the bil but i dnt how am isuppoed gto do that.My no is an old no since te start of the cell phones in kashmir.I have been paying the bill on time .but this seems to be less important to the BSNL eployees or their so called rules and regultions?. Kindly let me know about my bsnl broadband internet billing account details snf hoe to check my bill amount details through bsnl site. Pls send me link of wll bills inquiry..
how can add my telephone account to my user id in the bsnl website..
but due to the unique id is not in the bill….i coudnt able to add the bill…..
how would i know whethere my 1GB free dwonloading is availabe or not in my wirless EV-DO broadband connection? How to Pay BSNL BroadBand bill Online for Bangalore. Guys, i was searching for paying broadbandbills online. But i wasnt able to find the right website. I collected the information from the BSNL offc. 2. 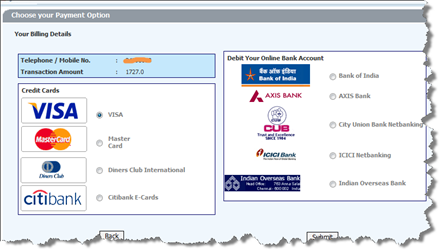 U see right hand side of the scree login for online services. Click on that. 4. Give all the required details and the consumer no. also. Dont mistake the consumer number with your telephone number. The consumer number would be on our bill. 5.And here yu are http://218.248.42.50:3307/login.jsp in login page to pay ur bills and view the bill details. Thanks deep for the information. how to pay the bsnl mob postpaid bill online. Plz tall me for landline call dital chargase?